Sound on TV does not work with cable. Help! Discussion in 'BYTE ME: Technology discussion' started by RedOctober3829, Nov 26, 2018. Wife and I bought 55” Westinghouse TVs on Black Friday for living room and hooked it up to the cable box and the sound did not work Sound works great with Apple TV and any smart apps loaded on the TV. It’s Optimum cable and we tried exchanging the boxes thinking they’re outdated but they said it’s the most up to date box other than the expensive Altice one. We also looked through the various cable and tv audio settings and nothing changed. My brother in law bought the same tv and is having the same issue. My mother in law did as well but has Fios and her sound on cable works. Odd. Is everything connected via HDMI or do you have optical or something else for audio. There is likely a setting somewhere in the cable box menu for the audio. See if you can find that menu and determine it's output. The next culprit may be a setting on the TV, but doesn't seem like it, based on what you described. What cable are you using to connect to tv? What are you you using to connect the cable box to the TV? Check that the setting on the cable box and tv are set for that connection to carry the audio. Then check that the cable you are using isn't failing. 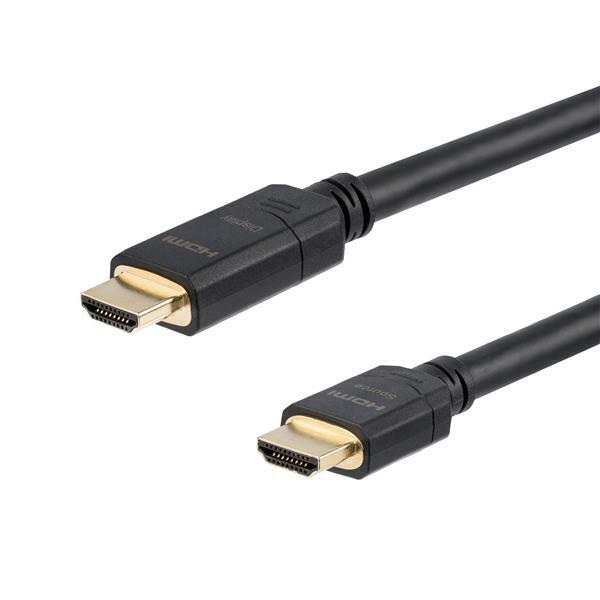 That's HDMI. Once you check your settings, try swapping in another cable. Everything is connected via hdmi. It’s a 4K TV and our last one wasn’t. Could it be that we have to have a 4K wire? Yes it looks very similar to that. 1. Swap the hdmi cables between the Apple TV and cable box. Any change? 2. Swap the inputs on the tv between Apple TV and cable (ie input 1/input 2). Any chance? Yeah we tried both. Nothing. Sounds like the cable box isn't out putting audio via HDMI. Either try changing the cable box settings or try another audio out put like component cables. This happened to me awhile back and it turned out the cable box was set to alternate audio (I think it was set to SAP maybe but details are fuzzy). Ty going through the audio setup and see if something looks wonky? I know you said you looked but this was buried someplace not obvious. I’m with Jayhoz, I think its the audio out settings on your cable box. There should be a audio out setting and it needs to be on HDMI. My cable box has a hidden settings menu I can only access with a password, so you may have to call tech support for your cable to get to it. So your audio was in Spanish haha. Perhaps RCA or optical but SAP is the Spanish audio, Remy would be quite disappointed that you didn't know this. SAP is also the alternate audio channel where you can hear things like the film's director commenting over the standard movie audio. If there is no alternate audio content, then I'd imagine you would hear nothing. For Comcast at least, sometimes the box flips out and changes over to the SAP setting unbidden. You have to use your cable box remote to get into setup and change the audio back to standard instead of SAP. HH has it, that's exactly what happened. SAP is the Second Audio Program. Sometimes it's Spanish, sometimes it's director's commentary or DVS (descriptions of what's going on visually, for the vision impaired) or French or something else, and sometimes it's nothing (just silent). Interesting I've always just heard it associated it with the "Spanish Audio"
More importantly does RedOct have audio yet? If the audio worked when you used the cable in question to connect the Apple TV to the TV then it isn't the cable. Update: My long national nightmare is over. Found the hdmi mode setting in an obscure area on the TV. Switched it to another mode and it worked. Very odd.